Bermuda swimmers continue to impress at the 2017 Carifta Swimming Championships being held in the Bahamas, winning 19 medals so far in the competition. Payton Zelkin won the 11-12 Girls 200 LC Meter Freestyle Gold Medal with a time of 2:12.77, which broke Elan Daley’s record time of 2:15.81 set back in January 2017 at the MAC Winter Invitational in Ontario, Canada. 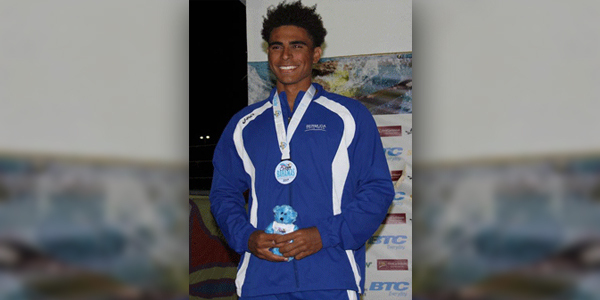 The time also set a new Carifta Swimming Championship Record, while Daley finished 6th clocking 2:18.96. Sam Williamson won the 11-12 Boys 200 LC Meter Freestyle Silver Medal clocking a time of 2:09.21. Logan Watson Brown won the 13-14 Girls 200 LC Meter Freestyle Silver Medal clocking 2:12.38, while Skyler Powell finished 8th with a time of 2:17.40. Brian Desmond finished 7th in the 13-14 Boys 200 LC Meter Freestyle clocking 2:06.80. Jesse Washington [pictured below] won the 15-17 Boys 200 LC Meter Freestyle Gold Medal touching the wall in a time of 1:54.41, breaking the record of 1:55.41 he set back on August 1st 2015 during the Canadian Age Group Championships in Quebec, Canada. Elan Daley won the Silver and Payton Zelkin won the Bronze in the 11-12 Girls 50 LC Meter Butterfly, Daley clocked 29.91, while Zelkin was clocked at 30.83. Williamson just missed out on a podium spot when he finished the 11-12 Boys 50 LC Meter Butterfly with a time of 28.97 that put him in 4th place. Watson Brown finished 4th competing in the 13-14 Girls 50 LC Meter Butterfly touching the wall in a time of 29.51. A time of 28.86 saw Moore finish 4th competing in the 15-17 Girls 50 LC Meter Butterfly. Washington finished 5th competing in the 15-17 Boys 50 LC Meter Butterfly clocking a time of 25.38. Taylor White captured the 11-12 Girls 100 LC Meter Backstroke Silver Medal with a time of 1:13.06, while Jessica Bruton finished 6th with a time of 1:16.92. Watson Brown finished 5th during the 13-14 Girls 100 LC Meter Backstroke recording a time of 1:11.28. Moore clocked a time of 1:08.67 on her way to finishing 5th in the 15-17 Girls 100 LC Meter Backstroke. Payton Zelkin won Gold and Elan Daley won Bronze in the 11-12 Girls 400 LC Meter IM, Zelkin clocked 5:27.70, while Daley clocked 5:37.40. Sam Williamson won the the 11-12 Boys 400 LC Meter IM Gold Medal with a time of 5:10.95. Skyler Powell finished 8th in the 13-14 Girls 400 LC Meter IM with a time of 5:35.24. Ethan Daley finished 8th in the 15-17 Boys 400 LC Meter IM when he was clocked at 5:01.81. The 11-12 Girls 400 LC Meter Medley Relay team of Jessica Bruton, Payton Zelkin, Elan Daley and Taylor White captured the Bronze Medal with a time of 4:59.49.